Tube storage and a tube rack in one. 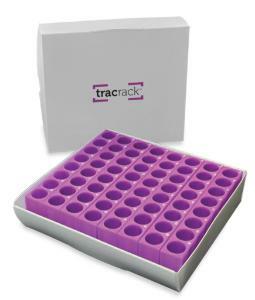 Removing and working with samples from cold temperature storage has never been easier than with the Ward's TracRack®. This rack and storage system eliminates the hassle of taking an entire rack of samples out of cold storage because the TracRack® enables lab professionals to remove one row of samples at a time. Eight individual segments are nested in a 2" polypropylene film box that allows users to easily open, identify, and remove only the segments of samples needed. 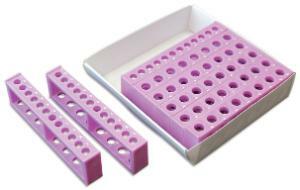 Once the segments are removed, simply replace the box lid and leave the remaining samples in storage. 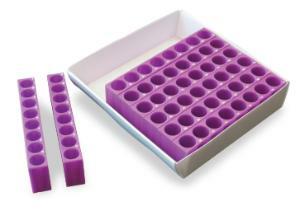 Each tube segment is made from durable polypropylene and allows for easy working while saving valuable counter space. Two versions are available.